Where is the Capital of South Dakota? 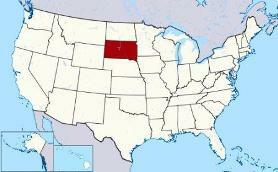 The Map of South Dakota (SD) shows the location of the state capital in the "Mount Rushmore State". South Dakota has 64 counties, and the capital of the State is Pierre. On a map, the capital city is always indicated by a star. Interesting fun facts about Pierre including its history, location, county, current population, size of the city and the nickname of Pierre, South Dakota. The Map of South Dakota and map provides an outline of the state, which covers 77,121 square miles. The size of the state's capital city, Pierre, is 13.07 square miles. Test your recognition skills of the map of the state, and knowledge of its capital, with our State Maps Quiz Game. The location of Pierre is in the center of the state at the Missouri River, opposite the city of Fort Pierre. 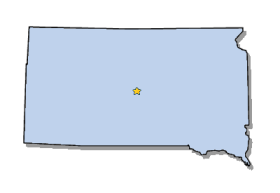 The city is located in Hughes county, South Dakota. Each of the 50 states have their own capital city. The city of Pierre is the capital of the state. The capital does not have to be the largest city in the state, but is usually centrally located either geographically or by population. Fact 3: The population of the capital city - 13,646. Nickname "Pierre City"
Fact 6 on History: In 1743 the French-Canadian explorer Pierre Gaultier de Varennes, sieur de La Verendrye (1685 - 1749) claimed the whole region for France. His sons visited the area and an early settlement consisting of fur traders. Fact 7 on History: In 1803, the United States completed the Louisiana Purchase in which 530,000,000 acres of territory in the United States was purchased from France for $15 million. Fact 8 on History: The area of Pierre was explored by members of the Lewis and Clark expedition (1804 to 1806) who made a favorable report that subsequently attracted settlers to the region. The number of people, or the population of the capital city of Pierre, obviously changes constantly but the government statistics for the 2010 population of Pierre was 13,646, which provides a good indication of the number of inhabitants of the city. We hope that the interesting facts and information about Pierre will help kids and school children with their homework. Learn more by playing the States and Capitals Game.